Welcome to the Fall Edition of the HeartCry magazine. It is our prayer that you are growing in the grace of Christ, laboring in His Name, and looking forward to His return. He who called you is faithful to preserve you until the end and to provide you with all that is necessary to live a life that is pleasing to Him. Therefore, “prove yourselves to be blameless and innocent, children of God above reproach in the midst of a crooked and perverse generation, among whom you appear as lights in the world” (Philippians 2:15). Let your confidence be found not in human will or strength, but in God’s decrees concerning you and His strong providence in working out what He has ordained. You did not choose Him, but He chose you and appointed you that you would go and bear fruit and that your fruit would remain (John 15:16). You are His workmanship, created in Christ Jesus for good works, which He prepared beforehand so that you would walk in them (Ephesians 2:10). This is your confidence and hope. Therefore, do not be slothful; rather, be diligent to obtain the prize and to live your life for His glory. At the very beginning of this edition, it is our joy to announce to you that our new website is up and running (www.heartcrymissionary.com)! We have worked for over a year to create the most informative site possible. Our goal has been four-fold. First, we wanted our site to glorify God, who has been our Patron and Helper throughout the many years of this ministry. Like David, we desire to proclaim His praises and the wondrous works that He has done (Psalm 78:4). Secondly, we wanted to encourage our donors by giving them a glimpse of all that God has accomplished through their prayers and support. Thirdly, we wanted to remind everyone that the great task of taking the Gospel to the world has not yet been fully accomplished. We must push away all distractions, put our hands to the plow, and labor until the task is done. Finally, we wanted to provide resources in as many languages as possible to help as many Christians as possible to grow in the grace and knowledge of Christ. We hope and pray with all our heart that the goals we have set forth will be accomplished; that God will be glorified; and that all who visit our site will be challenged, encouraged, and better equipped to labor for Christ’s cause in the Great Commission. As we were uploading our missionaries’ testimonies to the new HeartCry website, we were both blessed and challenged. In some instances, we were even moved to tears. 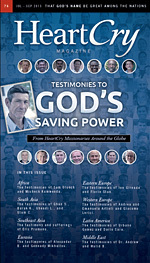 For this reason, we felt compelled to dedicate an entire magazine to the saving work of God among our missionaries. If these testimonies are a blessing to you, then please go to our new website, where you will find over two hundred similar testimonies of God’s grace.